Launch and Recovery Systems (LARS) generally deploy and recover vehicles or objects from and to water. Thereby – due to the relative movement of the object – the most crucial part is the docking of the objects while they are still in water. Whereas larger vessels benefit from their swell compensators, smaller ones, e.g. expedition ships, lack these items. Hence the market demands a small, affordable and retrofittable solution. 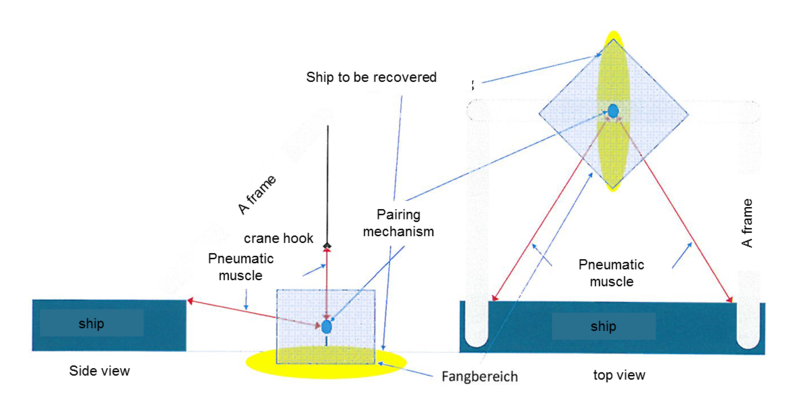 The automatic launch and recovery system aims to separate the very docking device and the crane itself. The actual load is carried only by the crane system. A system of three pneumatic muscles guides the hook towards the coupling devise, while also compensating any potential swell movement. The location of the floating object is determined by the use of multiple cameras and with the help of triangulation, if needed. This system is very light and easy to integrate, compared to typical onboard systems such as power supply and pressurized air. A second possible implementation is a picking robot at the end of the crane. Both systems are currently tested and will be developed further constantly.